So we haven't taken flights, gone on cruises or travelled as much as we would have liked to this year due to the pregnancy and the fact that we are saving up for a bigger family. That said, we still love getaways and once in a while, it feels awesome to whisk the kids away for a short holiday to a nearby destination. Remember our first visit to HARRIS Resort Waterfront Batam last year? 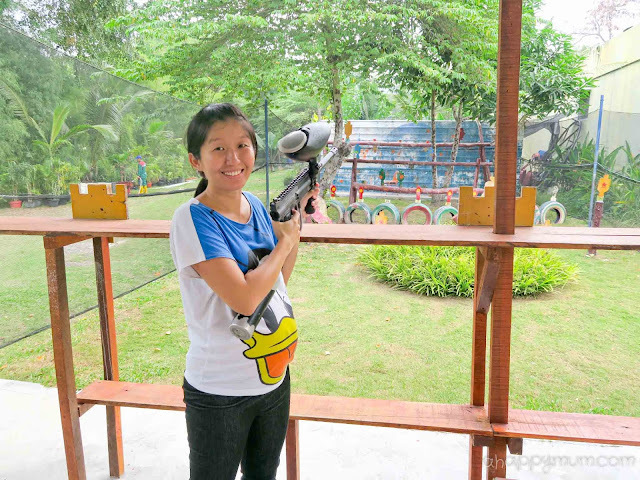 I was really honoured to be the first blogger from Singapore to visit their resort for a media review and was even more thrilled when they invited us again this year to check out their newly renovated facilities. I knew the kids were going to have a blast and to make it extra special this time, the hubby and I also brought along our parents so that we could have a rare family vacation together. 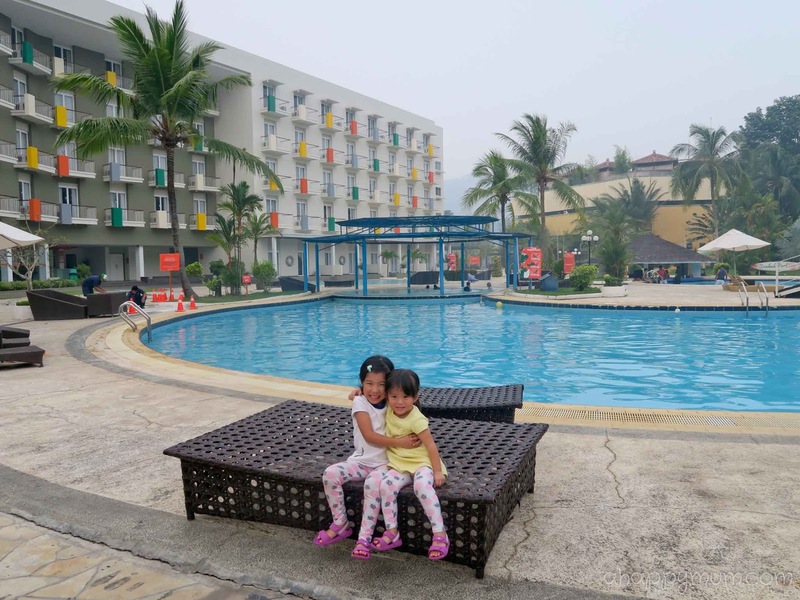 In this post, I'll share with you how this holiday resort is a family-friendly destination suitable for the young and old and the good news is I will be giving a 2D1N family stay for 2A2C, including a 1-hour couple spa. So do take the time to read till the end! To get to HARRIS Resort Waterfront Batam, the quickest and easiest way will be via Sindo Ferry which departs from the Harbourfront Centre. It is advisable to pre-book your tickets online, especially if you are travelling during the peak period. The journey takes only around one hour so it is quite bearable for both young kids and the elderly. You will need to arrive at Harbourfront Centre an hour before your departure time to check in your luggage and get your boarding passes if you have not printed them out. The ferry usually leaves promptly so do make sure you keep to the timing. At our point of booking, ferry tickets cost S$48 per adult and S$38 per child (aged 0-11), including surcharges and terminal fees. 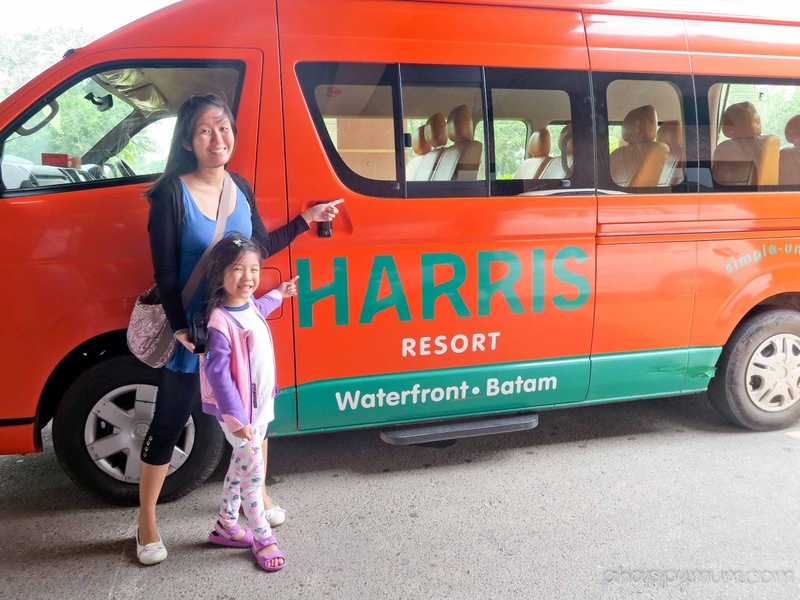 Once you reach Batam and clear the customs, look out for the orange shuttle service which is provided complimentary for all guests at HARRIS Resort. The friendly staff will be waiting for you and will also help to load your luggage onto the van. In case you are wondering, the journey to the resort takes only less than five minutes! The moment we stepped into the lobby, we could see the difference between then and now and were pleasantly surprised by the new, vibrant, minimalist look. 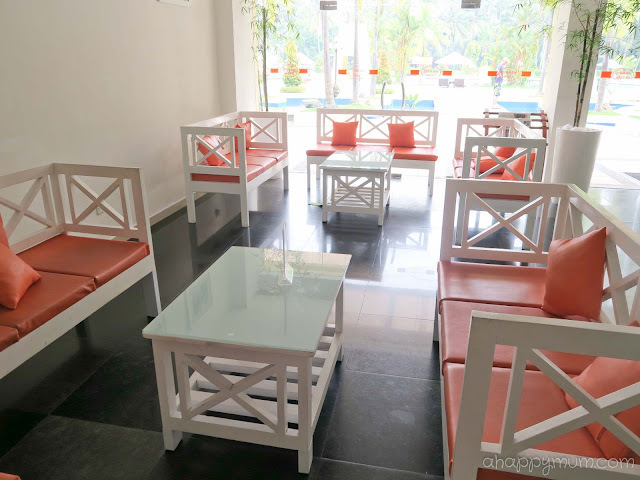 With a fresh coat of white paint and decorated with bright orange flowers, the reception area now looks welcoming and the lounge boasts a cosy and homely feel. While I was checking in, the parents and kids were able to sit around, rest and enjoy their welcome tea. 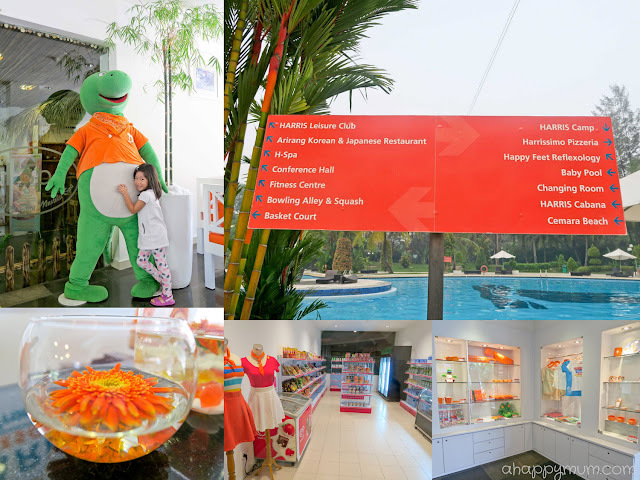 Personally, I like the choice of orange as the main colour and all around the resort, you can see orange signboards, orange flowers, an orange shirt on the dinosaur mascot, orange cushions and most of the merchandise sold is in orange too! The boutique, where you can get food, drinks and some daily necessities, has also been refurbished and now looks neater and more spacious. Coming to the rooms, I brought the parents to the guest rooms located on the second floor of the new wing and couldn't help but take a peek inside. The parents all agreed that the rooms, though quite typical, were big and clean enough for their liking and the amenities sufficed to meet their needs. 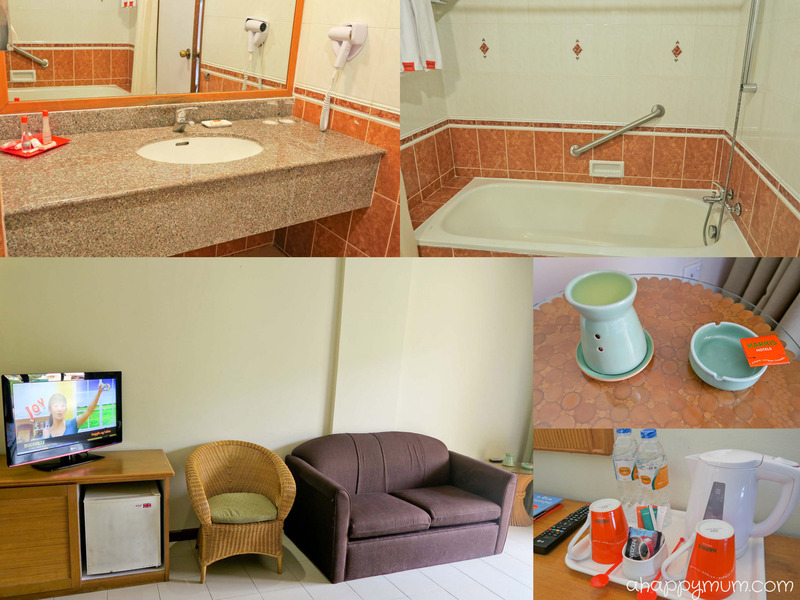 These included an in-room TV, safe deposit box, coffee and tea making facilities, bar fridge, toiletries, balcony, desk and couch. 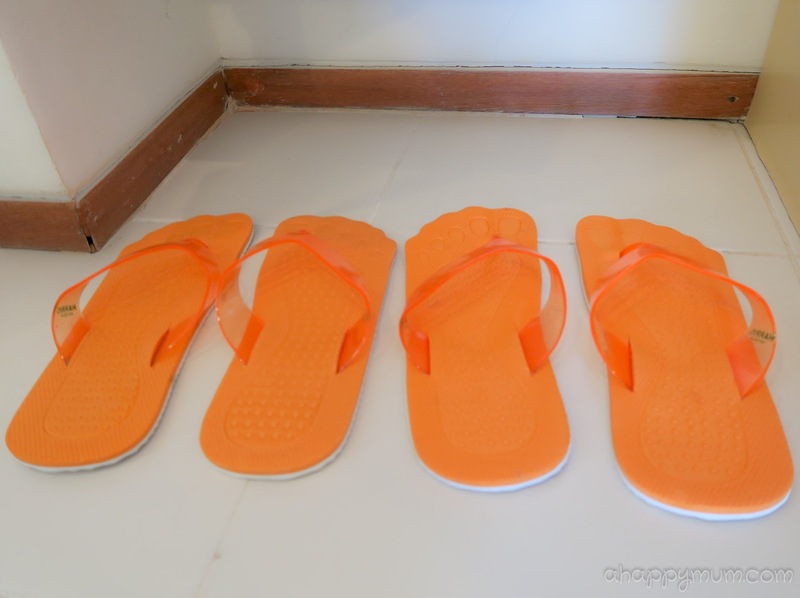 We also liked that slippers are provided for all adult guests and they can wear these to roam around the resort instead of having to put on covered shoes or bring their own slippers. On the other hand, the kids couldn't wait to check into the Family Room once again! Out of the 310 rooms in the resort, there are only eight of these family rooms which are located in the old wing. Anyway, the new and old wings are adjoined so we could get from one to another easily when we wanted to look for our parents. King-sized bed, double decker kids' bed with a pull out bed, couch, rattan armchair, bar fridge, closet, in room aroma, hairdryer, bathtub, kids' table and chairs, and a porch that comes complete with deck chairs and is just next to the swimming pool - this was a room that would be hard not to fall in love with. For these two water babies, they were especially happy that we could go for a dip anytime and all we had to do was to open the glass door to the porch, walk a few steps to the pool, have a splashing fun time and then come back to the room to bathe. How convenient! Unless you choose to venture out of the resort every day, if not you will probably dine in HARRIS Café - the signature restaurant in the resort. The restaurant has also been refurbished and now has a more contemporary and inviting new look. 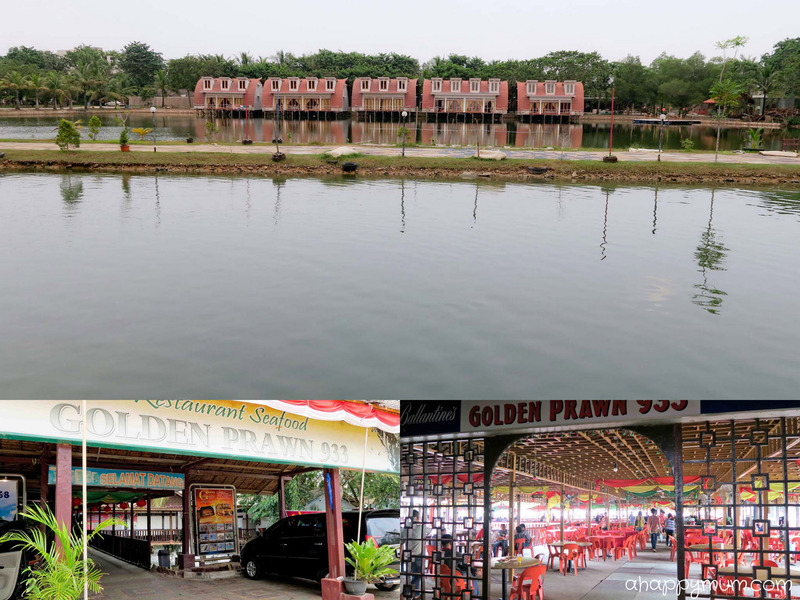 Our family had a total of five meals here which included two breakfast, one lunch and two dinners, so we had ample opportunities to try out different dishes on the menu. 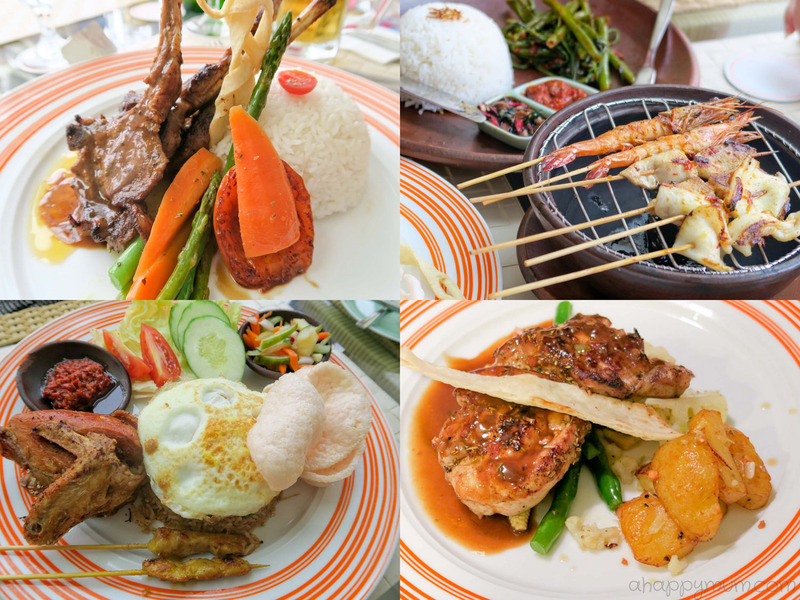 We tried many of the Indonesian favourite dishes, including Sari Laut Bakar (grilled prawn, calamari and snapper), Nasi Goreng Kampung (fried rice with chicken and egg), Crispy Duck Leg, as well as some Western flavours like Char Grilled Tenderloin and Grilled Lamb Chops. I was really glad to see that the parents were quite satisfied with the food although they were a little skeptical if it would match their taste buds initially. 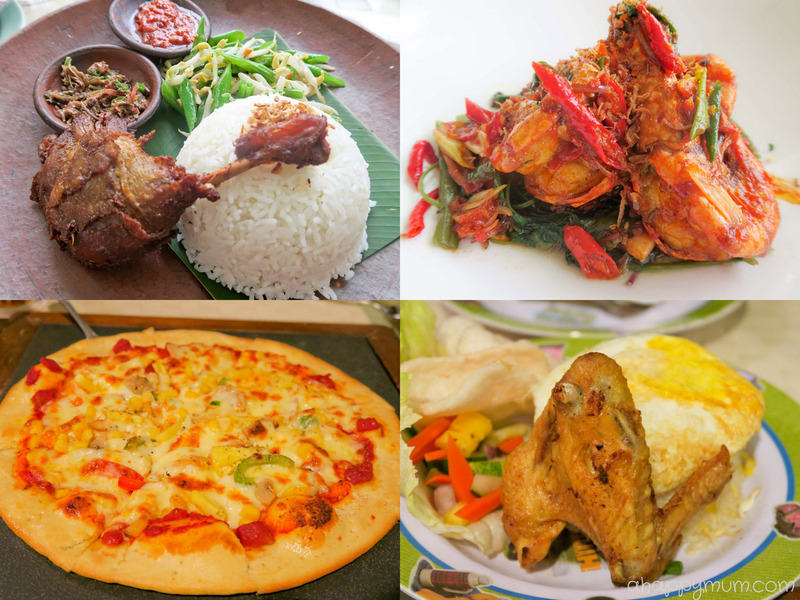 If I had to pick my personal favourites, they would be the Crispy Duck with rice and the Tom Yum soup! 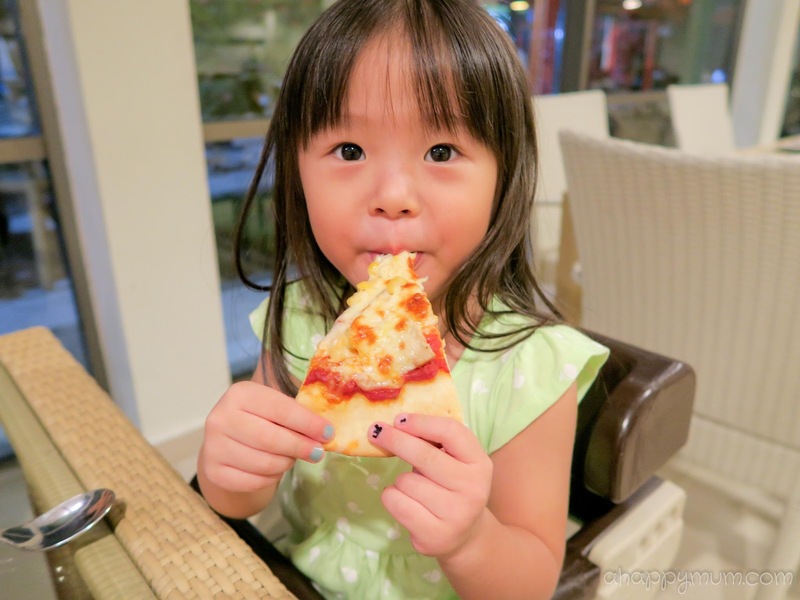 For the kids, you can order pizza or pasta for them or get items like fried chicken wings, hot dogs, beef fillet and fried rice from the Kids' Menu. As far as I could see, the girls were really happy during mealtimes and that was a relief for me. On our first night of stay, we were thinking of what to eat for dinner and were pleasantly surprised to see that there was a steamboat and BBQ option at HARRIS Café, which naturally became our choice for that meal. Now, I wouldn't say that it was the best or most value for money steamboat we've ever had, and to be honest the soup was a tad too salty for our liking. However, at least the ingredients were fresh, salad appetizers and fruit desserts were provided, and in the first place, it was rare to be able to enjoy a family steamboat together when you are on a vacation, don't you think so? 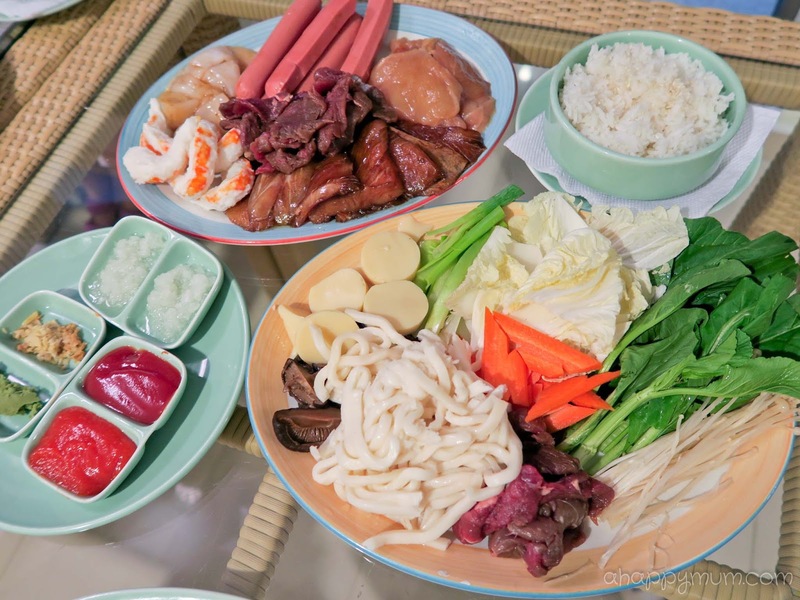 Moving on to breakfast, there is quite a widespread of food including Western and Asian dishes, porridge, cereal, pastry, freshly made pancakes, omelettes and even carrot cake. 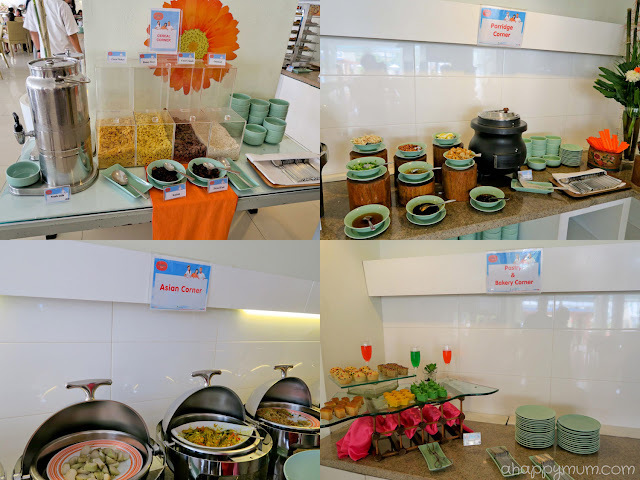 While the quality and taste might not match that of a hotel breakfast, the variety is definitely commendable for a resort standard and is more than enough to cater to our family's needs for a good and wholesome first meal of the day. If there is one thing I would most like to credit the staff, it would be their service. 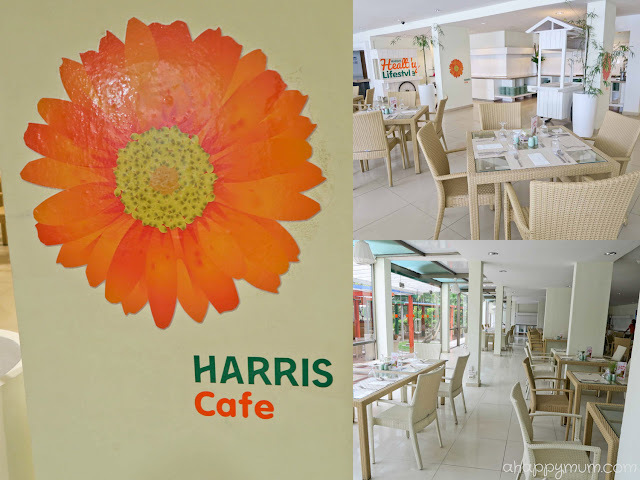 The hubby and I have always been impressed with how friendly and helpful the people are at HARRIS and our parents were also pleasantly surprised by how they paid attention to details and were kind enough to go the extra mile for their guests. 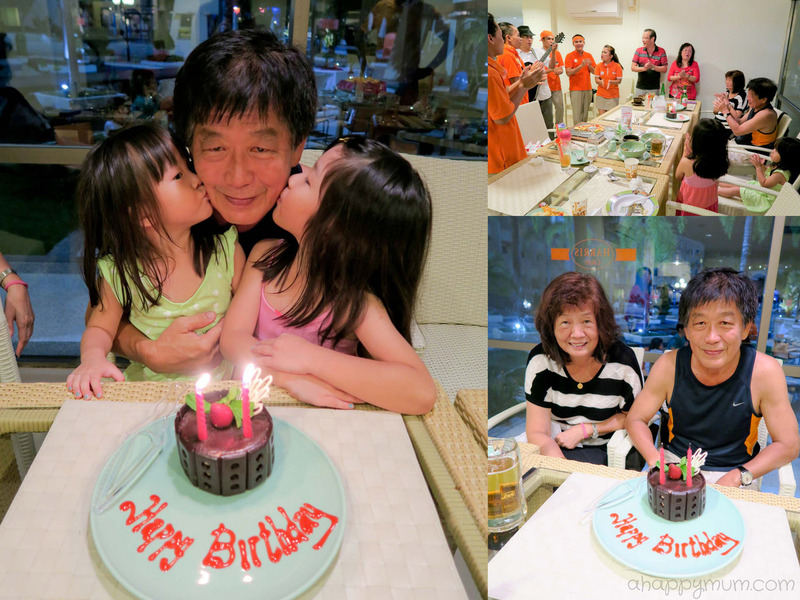 One most memorable incident was on my dad's birthday on our second day. I had informed the staff about it so that we could have a cake cutting celebration for him. But no, they didn't just deliver a cake, they had all the waiters and waitresses on standby and when it was time, all of them came over to wish my dad and sing him a birthday song which made his special day extra special. 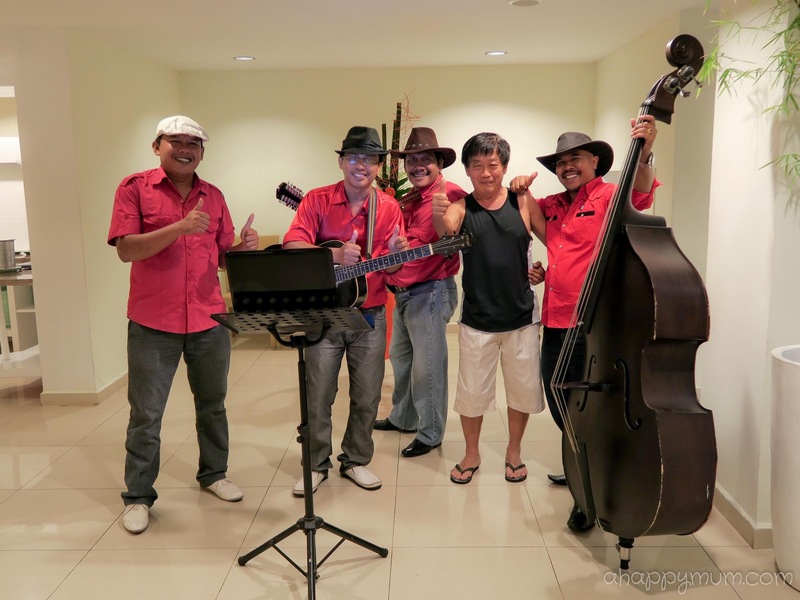 In addition, my parents and in laws especially loved the live band who performed every night because not only could they perform and play musical instruments well, they could even sing some classic Hokkien and Mandarin songs which really delighted the old folks. Yes, though we didn't get to enjoy a karaoke session at HARRIS because we realised most of the songs were in Korean since the lounge is owned by the Korean restaurant, we had a truly fun and merry session with the live band in the restaurant. The resorts has several facilities, some of which are new, for everyone in the family to enjoy so you don't have to worry about having a dull moment when you are at HARRIS Resort. 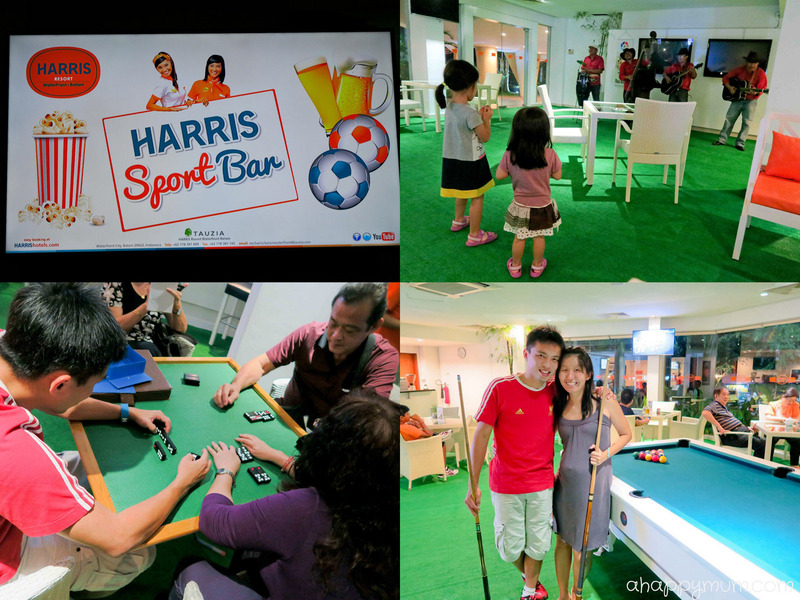 One of the new facilities is the HARRIS Sports Bar where you can chill, watch football, have a drink and play some recreational games like mahjong, cards, chess, board games and pool. We decided to hang out here after dinner on both nights since it is located right across HARRIS Café and was the perfect spot for our family to relax and get together. Best of all, the live band would perform here every night too and by then, we had become friends with them and you should have seen how the hubby and my father went up to sing with them and how the two girls couldn't stop dancing to their every song. It was also the first time we saw our parents challenge each other at the pool table and everyone laughed so much that you bet it would make a lasting memory in our hearts for a long time. 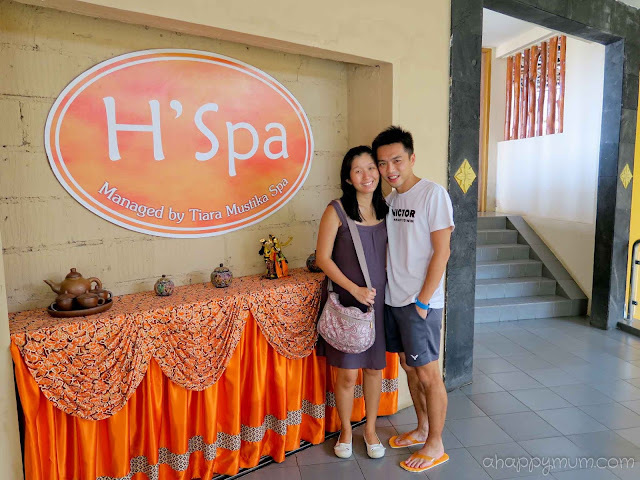 For those who prefer to take it easy and would like to go for a massage, body scrub, facial or foot reflexology, then be sure to visit the H' Spa and Wellness Centre which is located in the resort and provides 31 kinds of treatment. You can make your booking at the H' Spa reception at the lobby or call to make an appointment in advance. You can also choose to have your session in the open air gazebo or in the privacy of your own room. This trip was particularly memorable for me because after over 30 years, I finally went for a spa session together with my parents! Yes, it is safe for pregnant women and the experienced masseuse will know what should or should not be done during the massage. All you need to do is to sit back, lie down and enjoy! I'm not particularly into manicures and pedicures and chose to go to the beach instead when my mum and mother-in-law went for their nail pampering session. According to them, the service was quite good and the prices were affordable, so these two ladies totally enjoyed it. Phew. 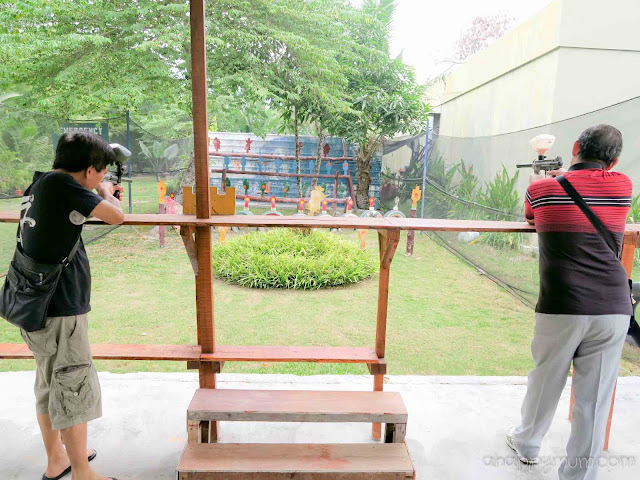 If your family is into more exciting activities like sports and outdoors, then you will be happy to know that HARRIS Resort Waterfront Batam offers a range of such activities including table tennis, gym, bowling, beach volleyball, paintball, airsoft gun, ATV ride, jet ski, kayaking, wakeboarding, banana boat, flying fox and so on. You don't worry about having nothing to do; you worry about not having enough time to do everything you wish to do! 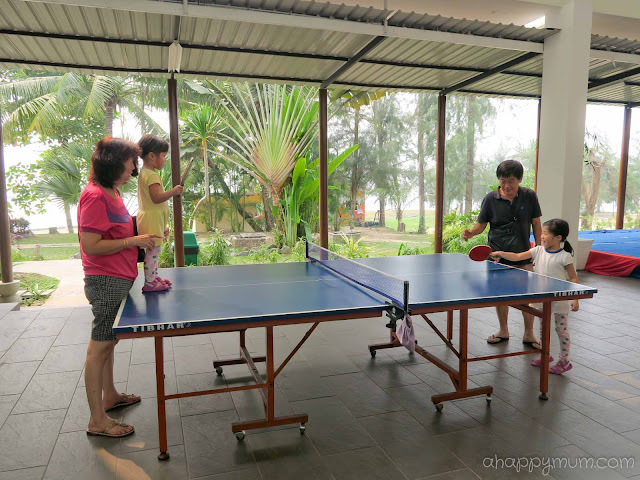 The table tennis table is located between the old and new wings, so we would walk past it several times and every time we do, we can't help but take up the rackets to have a game of ping pong! The kids would try to learn to hit the ball across while the parents would compete to see who was better (I must say the dads were both quite skilled at the game!). 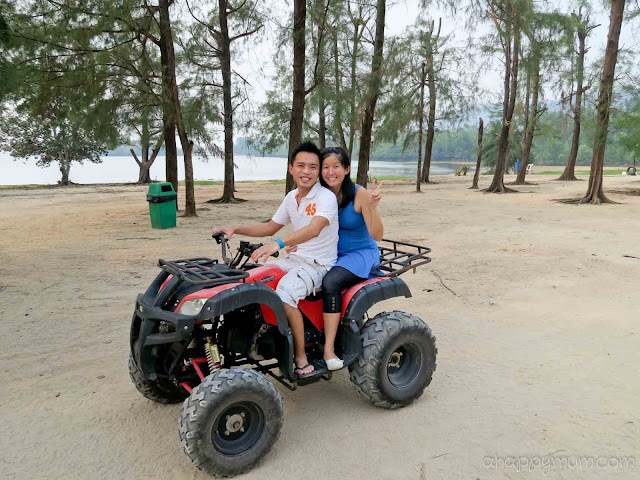 It was also our first time on the ATV (all-terrain vehicle) and that was quite a feat for not just us, but our parents as well! My mum even took over the steering and attempted to take control of the massive vehicle. Yeah, now you know where my adventurous and daring genes come from! I know I know, I probably should shun away from outdoor activities since I was pregnant at that time but seriously, these chances don't come knocking on my door often and I must say I was thankful to my hubby, parents and in-laws who supported and in fact, were the very ones who gave me the opportunities to try out the activities! I think they all knew that I would take cautious care and keep myself safe so I was glad that they trusted me. That's the thing about pregnancies, right? The more you go through, the more the rules get thrown out of the window because with experience, you are more aware of your body and know what can be done and what cannot. It's the same as how I was hesitant to eat sashimi when I had my first baby but now, with approval from my gynae, I do it in moderation and keep myself happy. 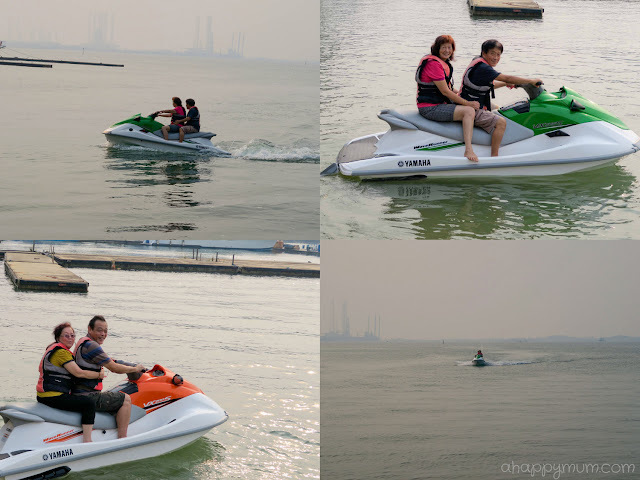 Moving onto the sea, we also tried jet skiing which was not a first for me but it was the first time I did it with the hubby. So, yes, another precious memory for us as a couple! In fact, our parents also tried it and I have to applaud them for their willingness to try and their courage to persist. Just so you know, you will have to pay extra for most of these activities so do select those that really interest you and your other half. If you are into shooting like me, then paintball and airsoft gun might be of interest to you. Do note that paintball is done outdoors and there will be plenty of mosquitoes in that area! 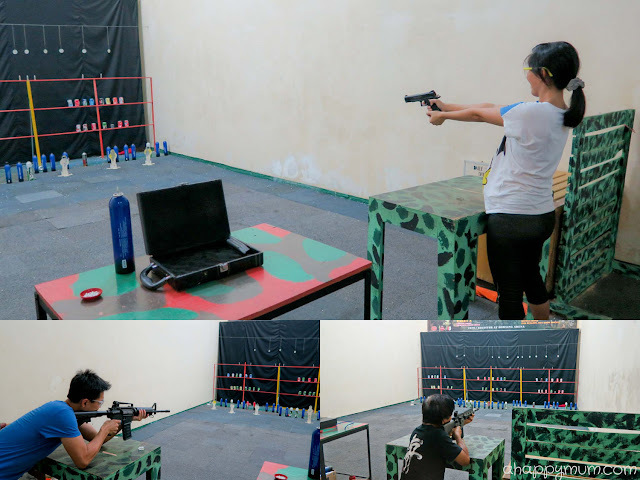 If you have family members who would just like to try a few shots, the staff is pretty flexible about it and you can buy just one package to share among yourselves. For the airsoft gun, it will be done indoors and you can choose between using a pistol or a rifle. The hubby and I did this last year and so we couldn't miss out on doing it again this year! This game might seem boring and uninteresting to most, especially girls, but I really enjoyed it and it will definitely be one of my favourite activities in the resort. So, what's there for the kids to do and have fun? If your kids are fond of water and like to have a splashing good time, then it will be great news to know that HARRIS Resort Waterfront Batam has the largest swimming pool in Batam! While the kids have fun in the water, parents or elderly who are not so into swimming can also choose to rest and relax on the lounge beds, enjoy the sun and have a drink or two. Isn't it just perfect for everyone? Besides the pool, there is also a beach for everyone to enjoy and kids can have fun building sandcastles, playing beach ball or hunting or sea creatures. Our only regret will be that we didn't have enough time for the kids to stay long enough! If you don't know by now, there is also a Dino Kids Club catered for the little ones. The club opens from 9am to 5pm daily and offers programs like colouring, hand painting, balloon modelling, games, cooking classes and fishing for the children. 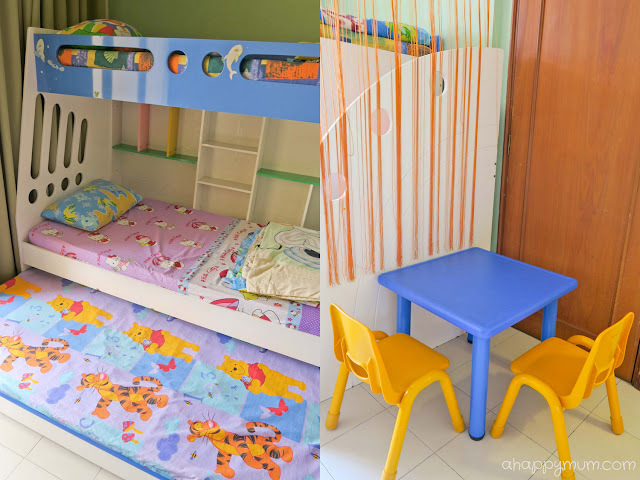 This service is provided free for families who stay at the resort and comes in handy when daddy and mummy wish to have some quiet time or a couple session. 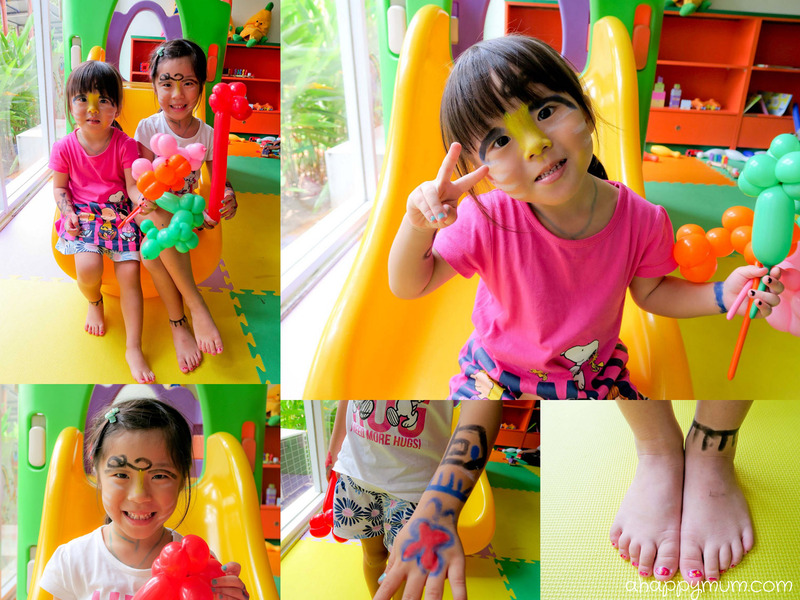 So while we were at ATV and jet ski, the kids were busy painting themselves. Yes, I mean it, Angel said she requested to draw on herself and meimei and so they showed me how they had on eyeshadow, ribbons, bracelets, necklaces and even anklets. Quite creative, I must say! 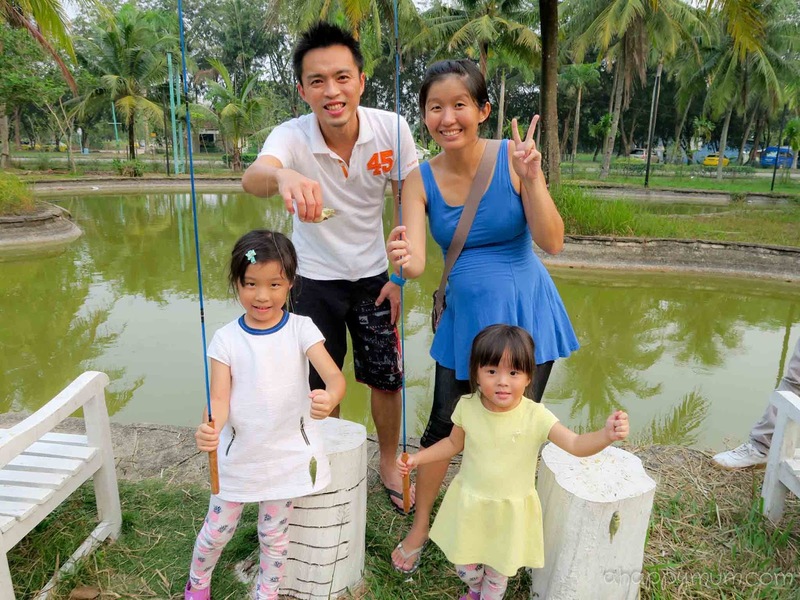 One of their most well-liked activities last year was the fun fishing for kids so we were glad to know that it still takes place at the Dino Kids Club. 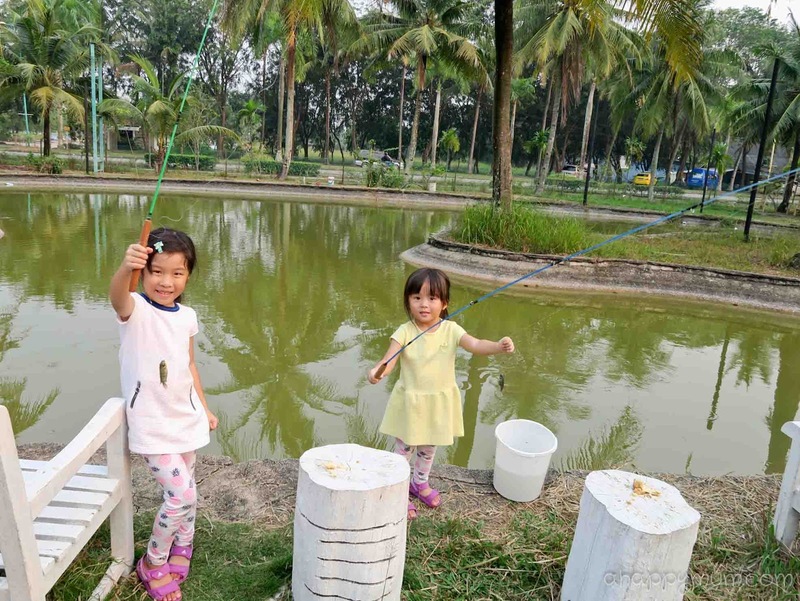 At 4pm everyday, the kids will be able to fish for real fish at the pond! Fishing rods, buckets and bread will be provided by the staff so all you need is mosquito repellent if you don't wish to get badly bitten. 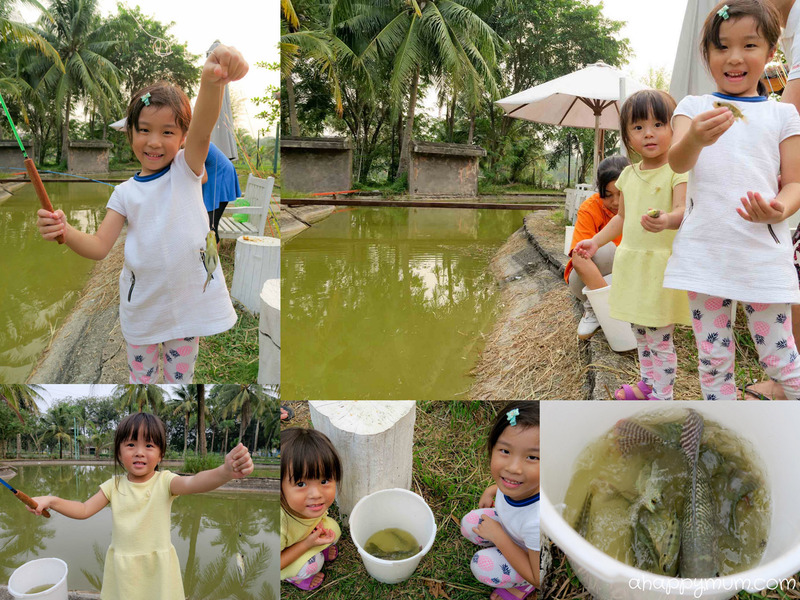 The girls were thrilled every time they caught a fish, no matter how little, and I thought it was a great way to train their patience and determination. We were also very surprised when the HARRIS staff managed to catch one really big fish too! Of course, we eventually released all of them back into the pond and this was another part that the girls loved because they got to hold the fish in their hands! Seeing their big smiles and sense of achievement, I really wouldn't mind battling the mozzies and doing this with the kids every single day if we could. 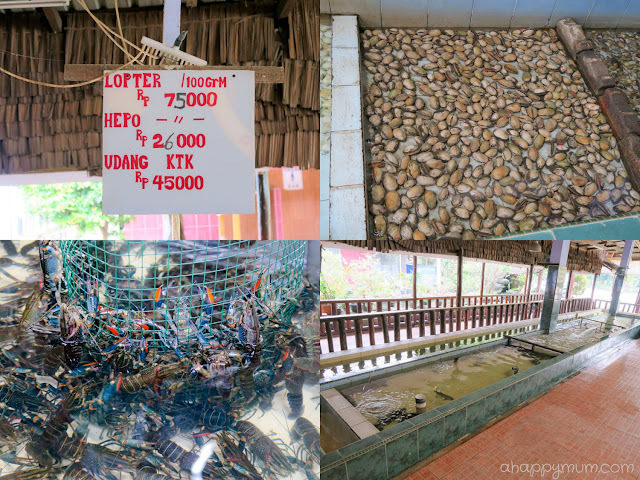 If you have time to spare, I would definitely recommend that you venture out of the resort for some sightseeing, shopping and seafood! Last year, we went to the Barelung Bridge, one of the famous icons in Batam, and had a yummy, fresh seafood lunch in Barelung Seafood Restaurant. 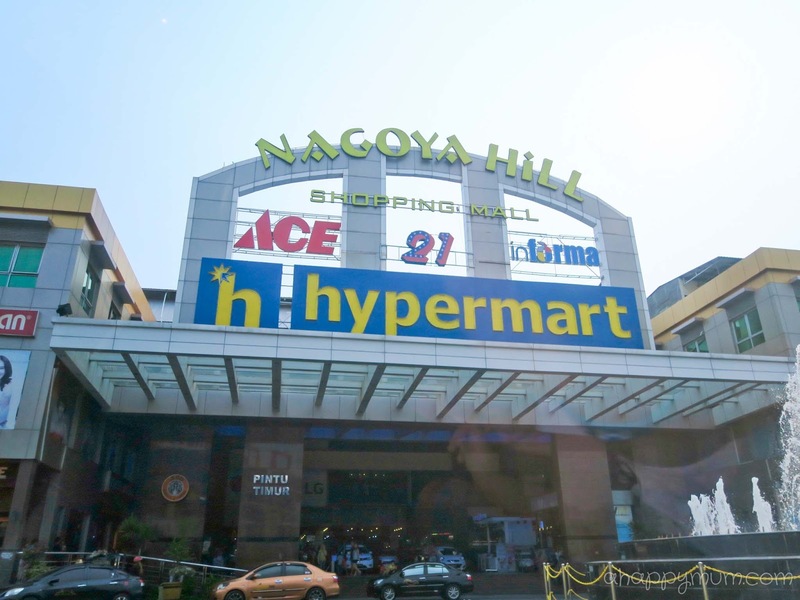 This time round, we decided to bring our parents for some shopping and so made our way to Nagoya Hill, which is one of the biggest shopping malls in Batam. If you are unsure of where to visit, simply go to the taxi reception outside the resort and ask the staff for a list of places you can visit. You can also book a reliable two-way taxi service at an affordable rate. 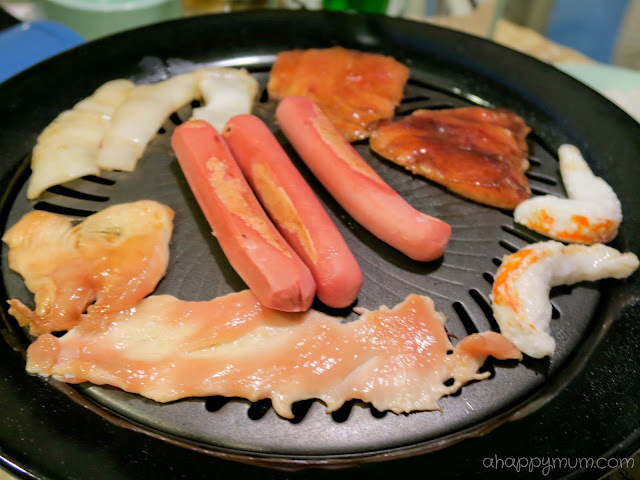 We spent a couple of hours in Nagoya Hill and other than getting some apparel for the kids, we also liked walking along the food street located in the building where you can sit down to enjoy some local cuisine or buy some local snacks to bring home for friends and family. 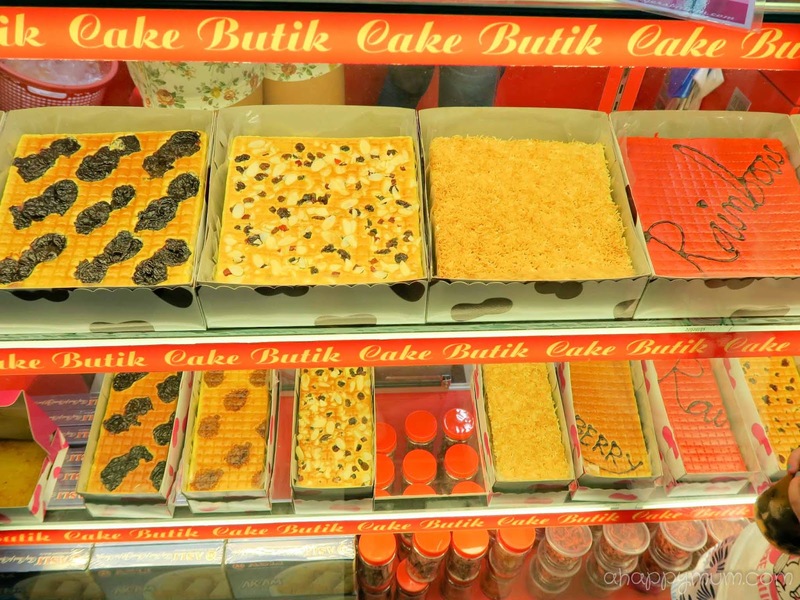 We heard that the kueh lapis is really famous here so we made sure we brought back not one, but two boxes, and they didn't disappoint! The last highlight of our trip will be a seafood lunch we had at Golden Prawn, which is one of the most popular fresh seafood restaurants in Batam. The place was huge, airy and cleaner than expected which helped to make us feel at ease. 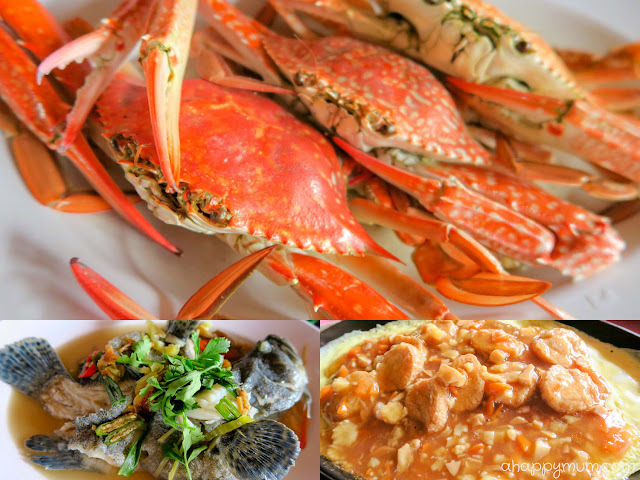 If you would like to, you can pick out what you would like for lunch from the fresh seafood variety that they have, including crabs, crayfish, prawns, fish, clams, lobsters and more. 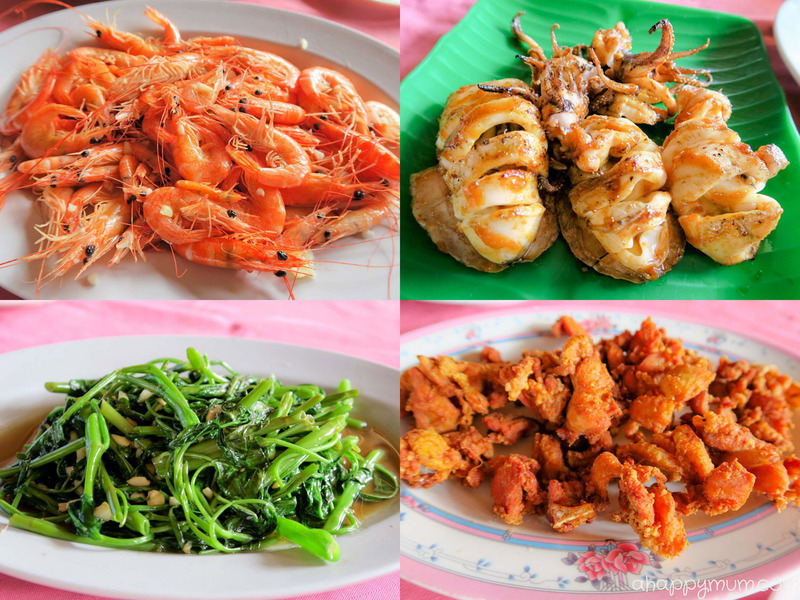 Now, among the eight of us, we ordered seven dishes including prawns, sotongs, chicken, crabs, fish, egg, and vegetable. For drinks, we had coconut juice and several bottles of beer too. How was the food? It was not only fresh but absolutely appetizing and delicious as well! I have to say it was definitely one of the best seafood meals we have ever had but you know what was the best part? The price! Now, how much would you think all the below would amount to? Reminder: The drinks are not in the pictures but you have to take them into consideration too! Honestly, we had a shock when we received the bill and the husband thought he read it wrongly. The whole meal only costed us S$92! Yes, for eight people! How surprisingly cheap and good. If only, if only, we had a restaurant with this sort of food quality and pricing in Singapore! 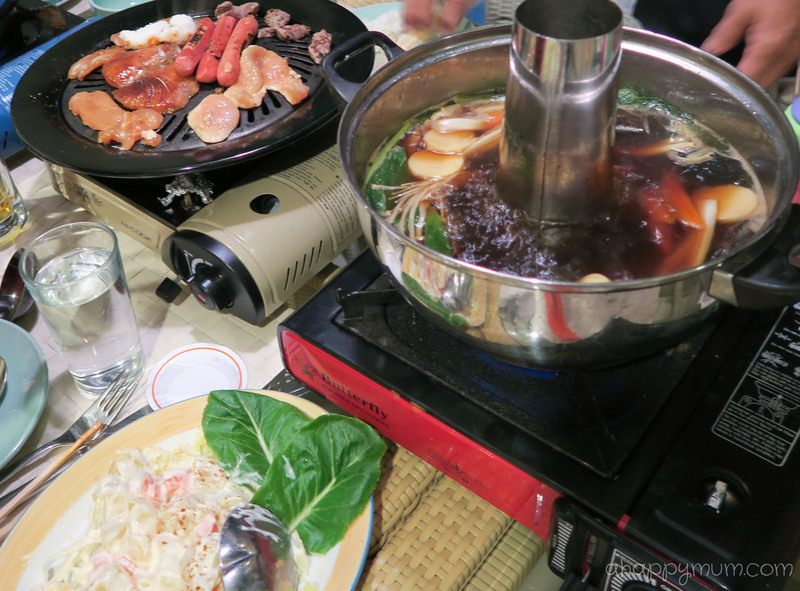 So, we ended our holiday with full stomachs and happy hearts. It was really a great time spent with our kids and parents and I definitely cherished the opportunity to go on such a family vacation. 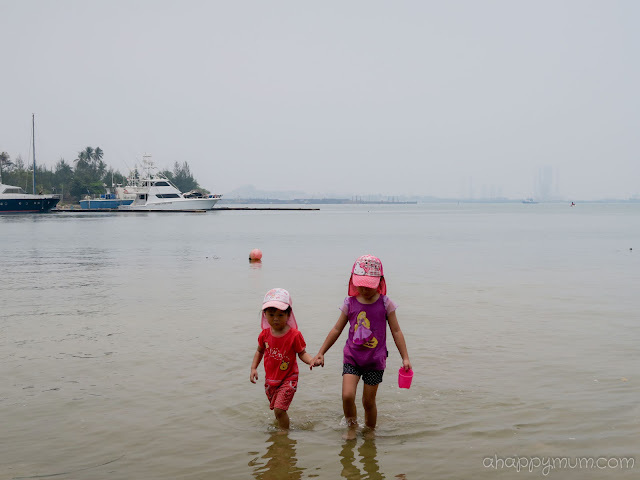 One thing for sure is that HARRIS Resort Waterfront Batam is definitely a holiday destination suitable for the young and the old and if you are to visit one day, which I hope you will, be sure to have lots of fun and create as many happy family memories as you can! 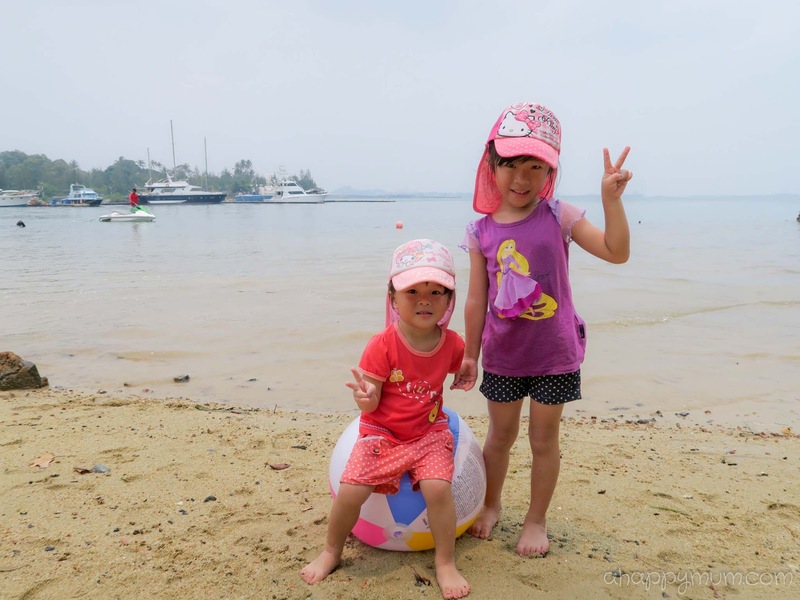 For those who wish to find out more about HARRIS Resort Waterfront Batam, here's a pretty cool video which shows you the fun-filled, family-friendly activities you can do there! Now, how does a family retreat and spa sound to you? 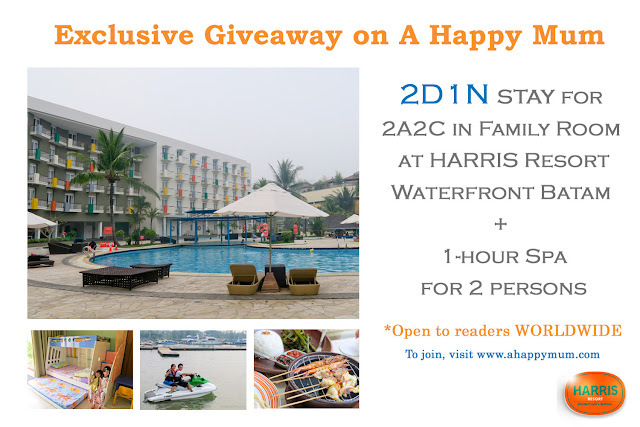 For those who are interested in a getaway to HARRIS Resort Waterfront Batam, here's your chance to win! Leave a comment at the end of this post with your name, email address and tell me what you like most about HARRIS Resort Waterfront Batam. Indicate in the Rafflecopter widget that you have done so and to increase your chances of winning, you can choose to follow the rest of the options. Best of luck! Good news! From now to 20 May 2016, all A Happy Mum readers and friends will get to enjoy a 10% discount off your visit to HARRIS Resort Waterfront Batam. Simply go to this link and enter the promotional code 'ahappymum' when you make the booking. Terms and conditions apply. If you wish to upgrade to a family or suite room, please contact the reservation team at res-harris-batamwaterfront@tauzia.com or call +62 778 381 888. Disclosure: We received a 3D2N accommodation in the HARRIS Family Room, complimentary 60-min spa sessions and selected dining and sports activities. All other expenditure were paid and all opinions are our own. The Family Room look totally awesome for a short getaway! 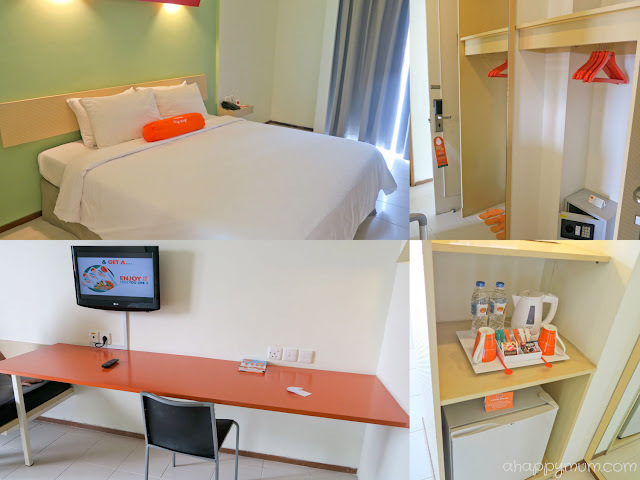 I love the whole overall of the awesome orange-y hotel! The family room is so big & comfy for family of 4 like us! 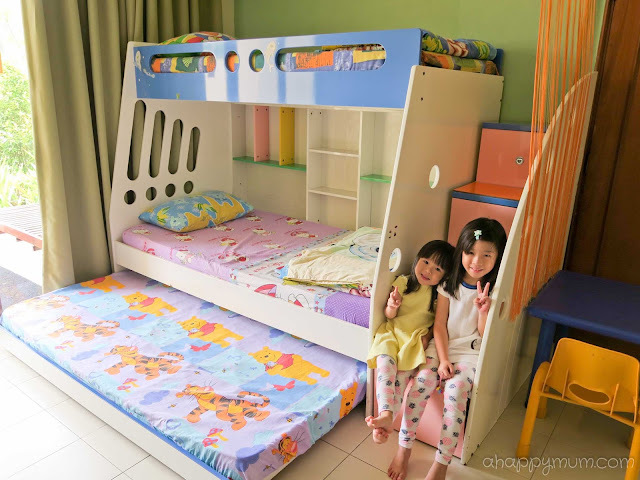 Am sure my 2 kiddos will be yelling in joy upon seeing their double decked bed! Hope to win this to have a getaway! The shooting looks tempting and the kids love the pool. I'm in love with the Dino Big Club ! My elder girl had been watching ( Channel 411 ) . She said that she did not experience fishing before . Just nice it includes a real life " fishing " . She'll be so happy ! Another thing is the double decker kids' bed ! I can imagine my 2 girls climbing up & down the bed , enjoying themselves to the fullest ! What a great short getaway from all the stressful , fast pacing society ! I love how the activities can cater to both young and old, everyone will have a blast! 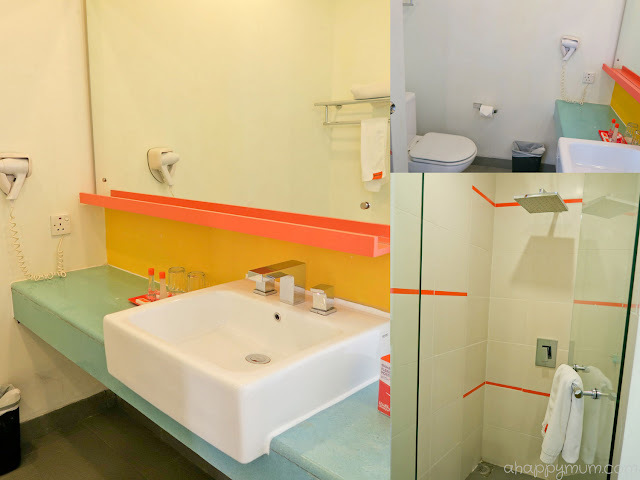 Love the bright colours of the accommodation and the kids friendly environment! Ooh...never been to Harris Batam before. Looks great! I love how the activities can cater for everyone. 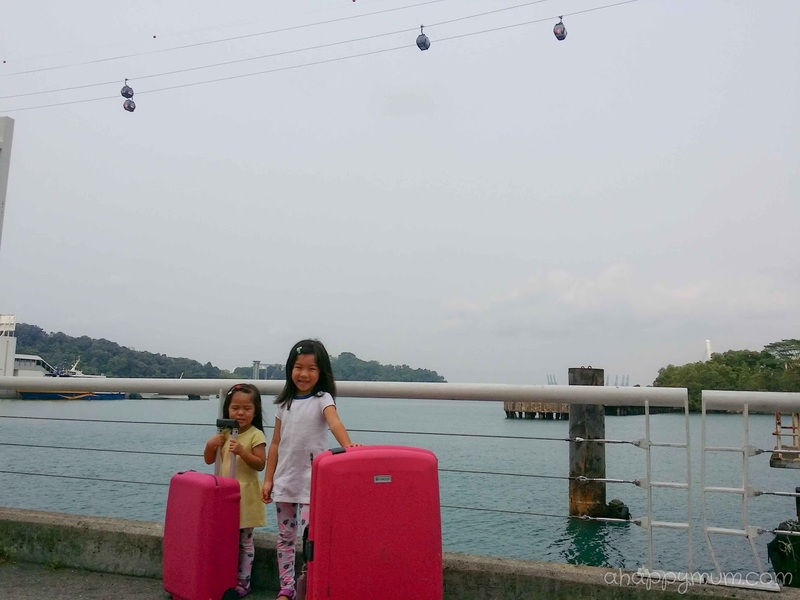 And the fact that batam is a short distance away from Sg, makes travelling so much easier for us travelling with 2 toddler. 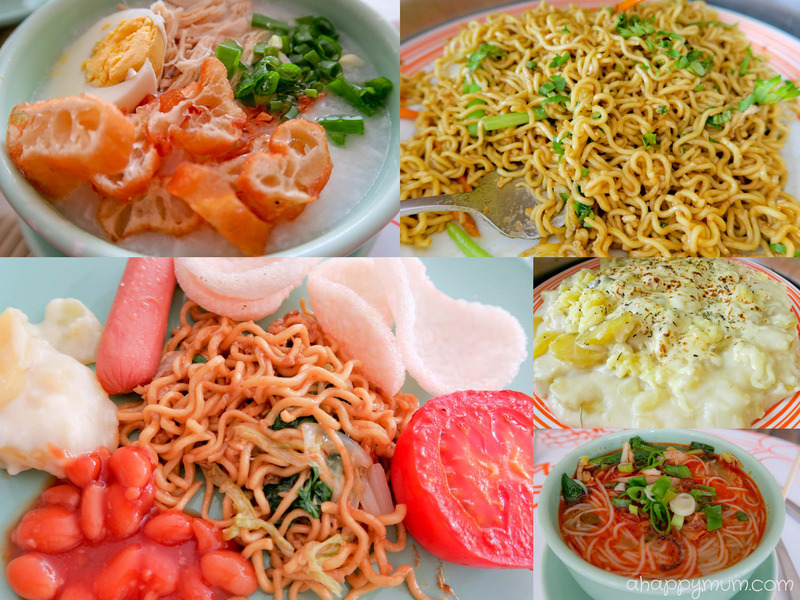 Love their wide varieties of both western & local buffet breakfast!! Awesome giveaway! The Family Room look totally great.. Hope to win so I can bring my gals for a short getaway in this school holiday.. Superb giveaway! Would love to win this & bring my sons for a holiday since they haven't really been out of SG before.. starting from somewhere near would be great! 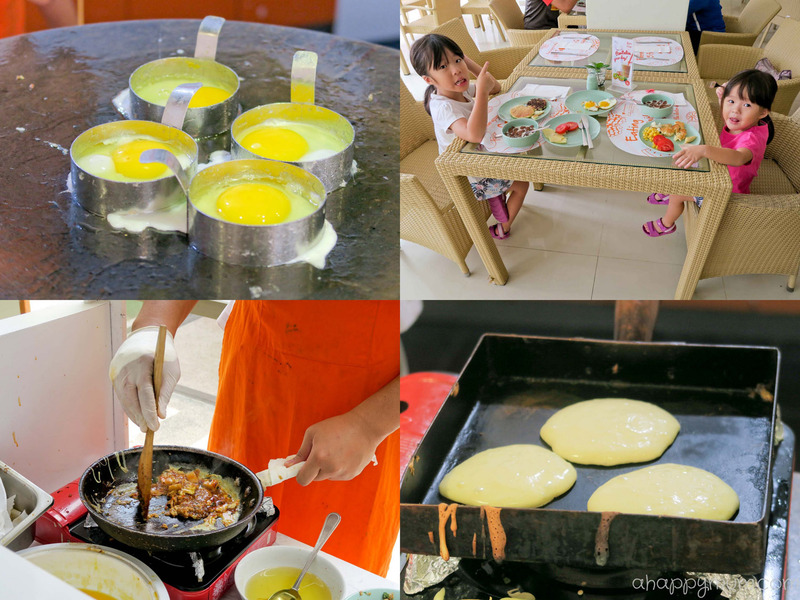 Love the various types of activities to do there, am sure the kids will nvr get bored there! I love bring orange room and kids room, also real fishing experience! I love the live seafood restaurant! The family room is nice. I would like to bring my family to Harris resort. I love the food !!! Looking at the happy photos posted by A Happy Mum, I know my 2 family will enjoy a vacation at this lovely place! Absolutely love the king bed and loft bed at the family room! It looks like the Resort have activities for the young, old and especially the little ones. 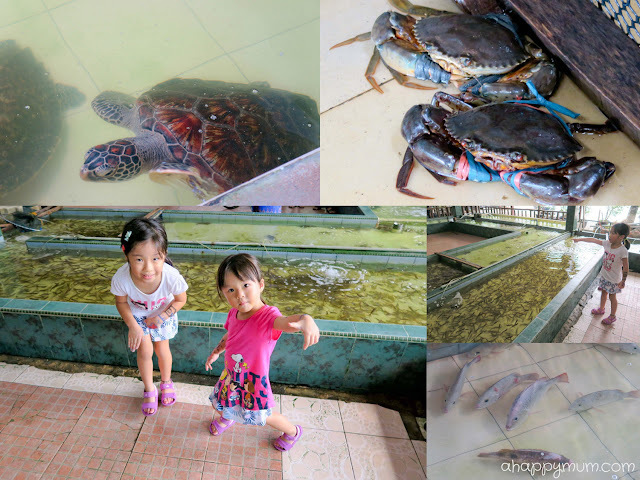 My girls will definitely enjoy the live fishing, pool and the Dino kids club. 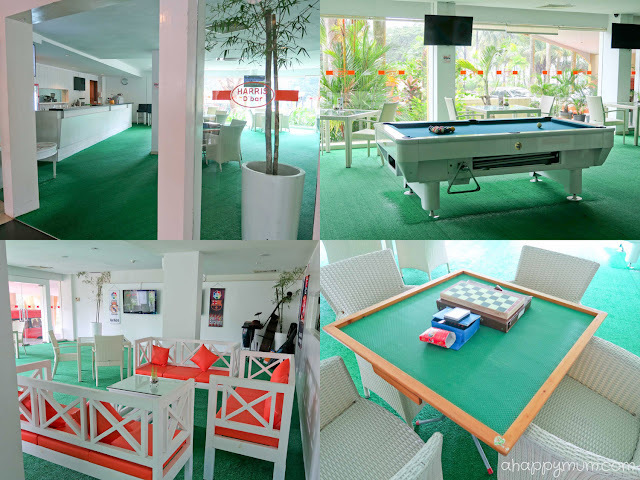 The resort will definitely make a great short getaway from Singapore! I love how the family room is situated right next to the pool. My daughter will be dying to go in a dip if we're there! I love the abundance of activities available for the whole family. 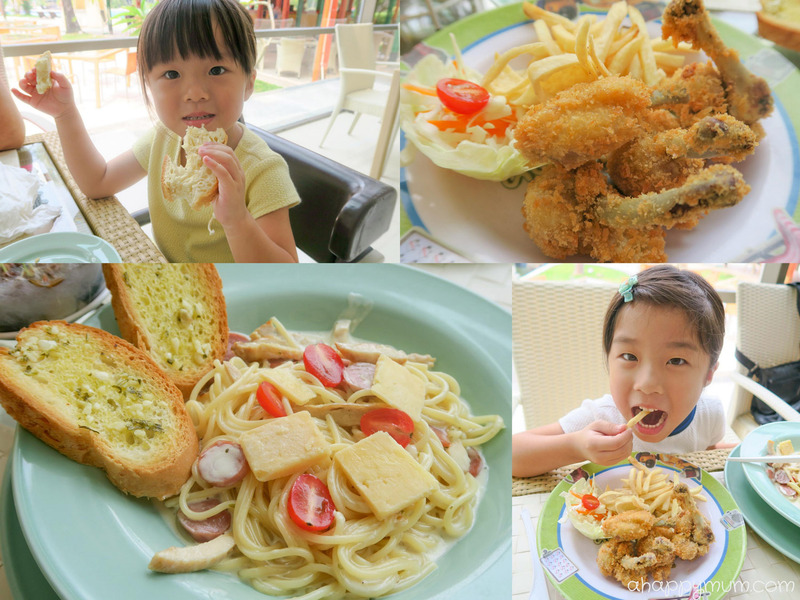 Sumptuous spread of food for my parents, spa for me, outdoor activities for hubby and Dino Kids Club for the kids. No family members will feel bored! Great to know that the resort has big family room with children can have their own bed. 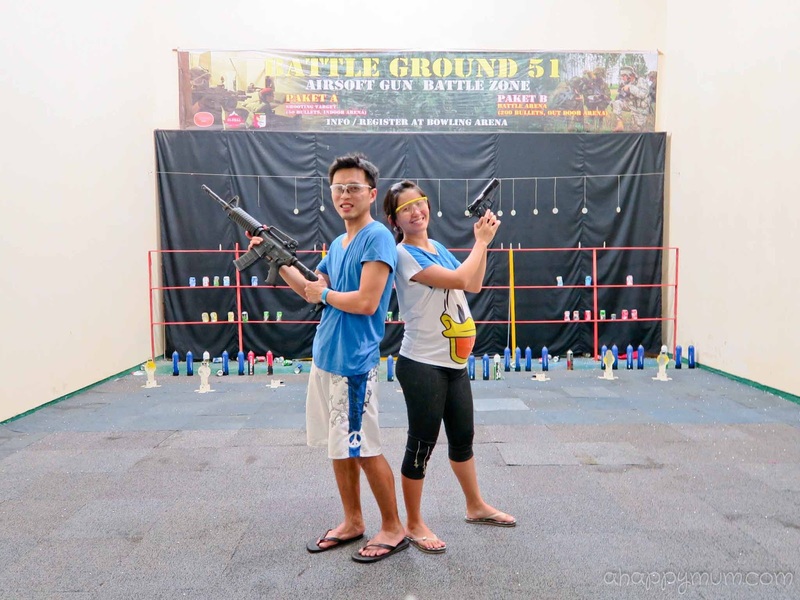 There are activities for everyone in the family to have a quality family bounding time. My 2 years old toddler definitely loves the Dino Kids Club and my 8 years old child should try out the fishing. I love the wide array of activities for everyone in the family! 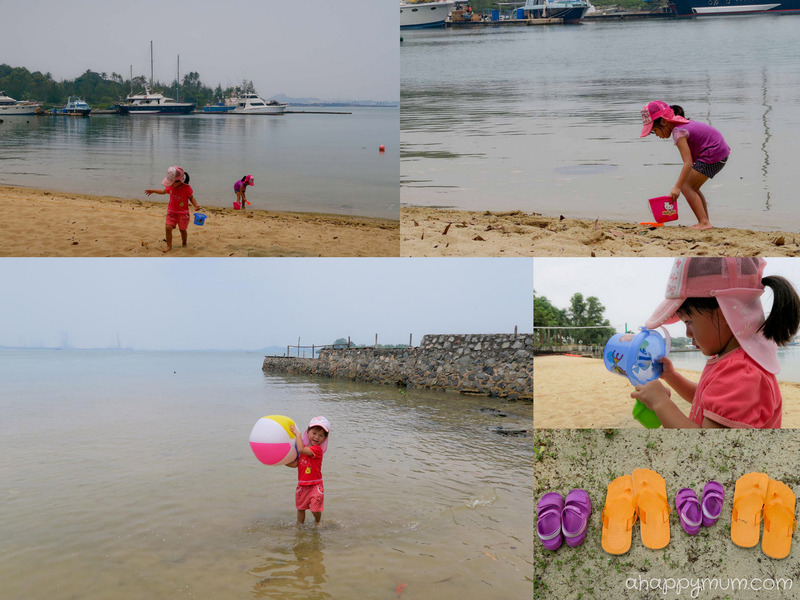 Honestly, I never ever tot of batam as a family getaway location but looks like it's a family friendly one! Thanks for the awesome and detailed sharing! I never knew the resort can be so fun and interesting! Thanks for sharing. 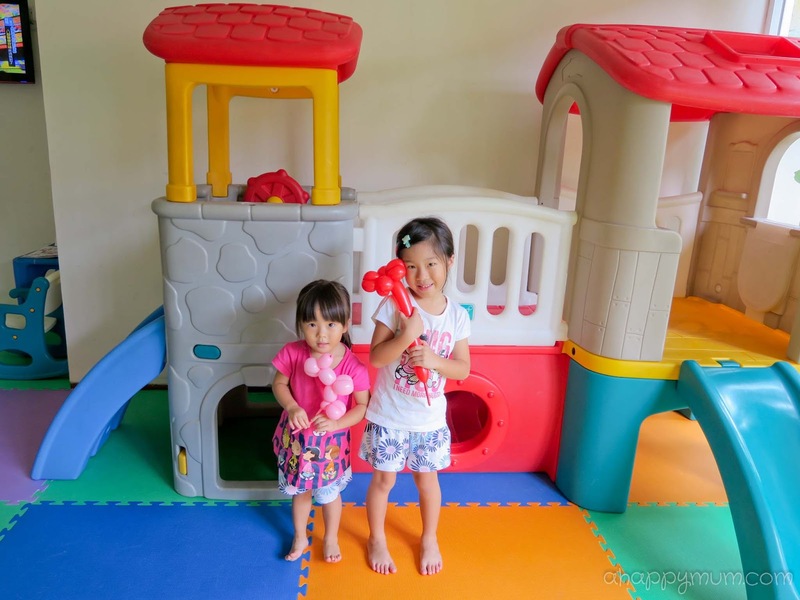 I am sure my two girls will love the room and all the activities! The family room is my favorite. Simple yet cosy, I will love to go there with my family. 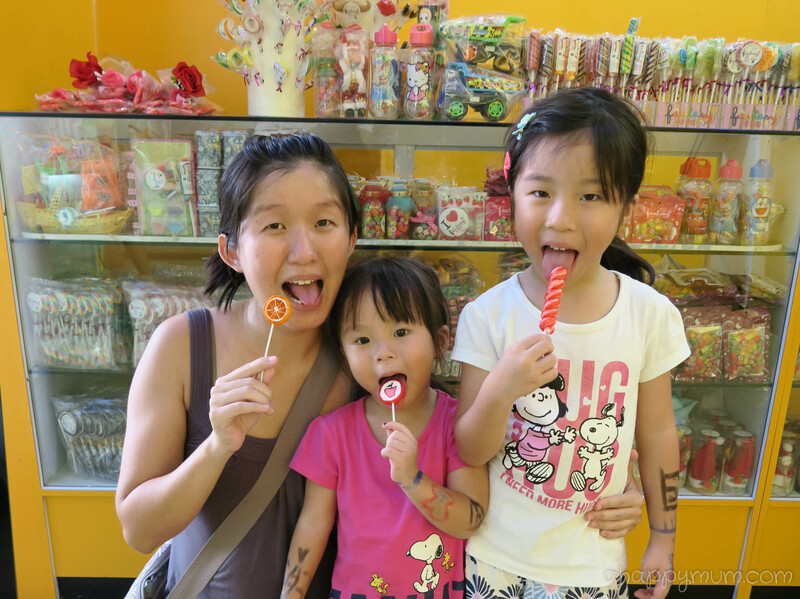 Love the family friendly activities and that we need not travel far with a toddler to enjoy a great holiday! I like it cos there are activities to cater to all of us of different ages. Spa n massages!!! Still remember our family vacation to Thailand where me n Mr. Hubby had to take turns n make a run to get our massages ... he took morning shift, I took night shift ... the kids club sounds good... so me n Mr. Hubby can both enjoy our massages TOGETHER!!! 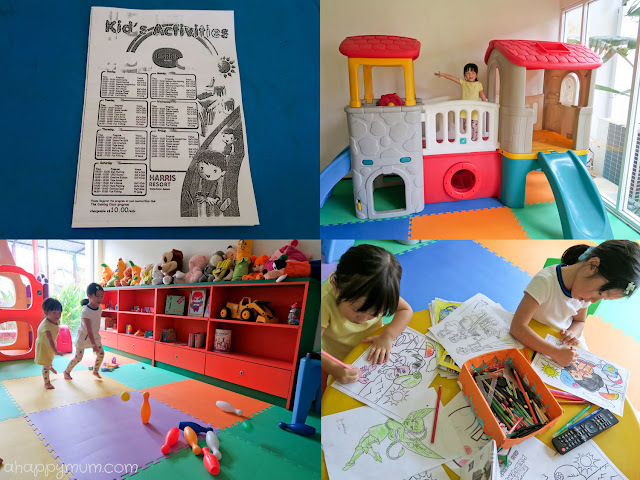 I like the Dino Kids Club - it looks like a fun place for my kids! double decker kids's bed attract my attention! The Family room which is just next to the swimming pool , which means my girl can go for a swim anytime of the day and be back in room for a change. That ensure she won't catch a cold on her way back to the hotel room and how convenient it is. 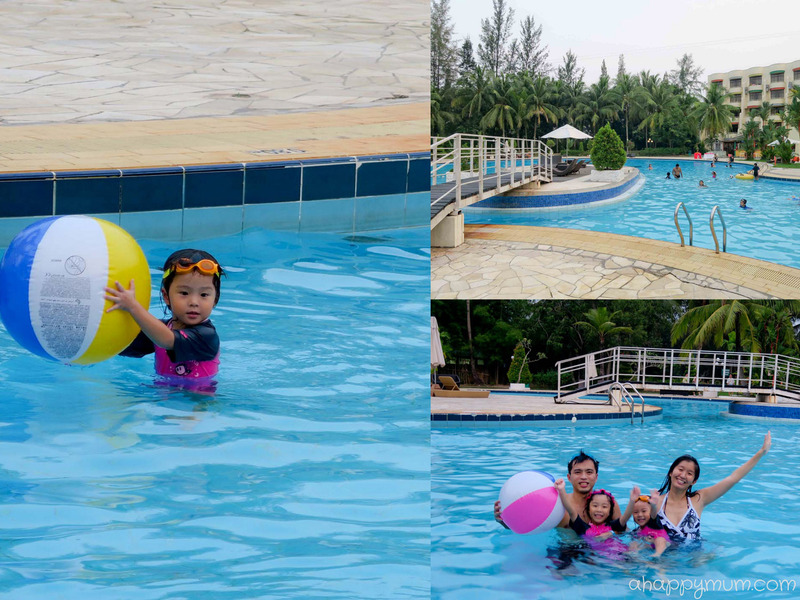 I love Harris resort's Swimming pool <3 & the water activity they have...I would really love to win & recharge myself from work & enjoy with the family. I love the Family Room which is perfect for parents like us with 2 little ones and I love that they have a Dino Kids Club to keep the little ones loaded with fun activities! I love the configuration of the family room, with the very cute double decker bed for children. Suitable for my boys for sure! Couldn't find a good place to bring my kids! I guess this is somewhere got a short n fun getaway! With the lovely family room, delicious breakfast buffet and the lovely swimming pool I am really thrilled to bring my family along to have a staycation there since we had never bring my kids to BATAM this is really a good chance for us to let them have fun there in our neighbour country. What I love most is that it feels to relaxing in the comfortable room, beach, activities and food. I really love the room as it is so.cosy for the whole family to stay in! I'm loving the big room, facilities and food. 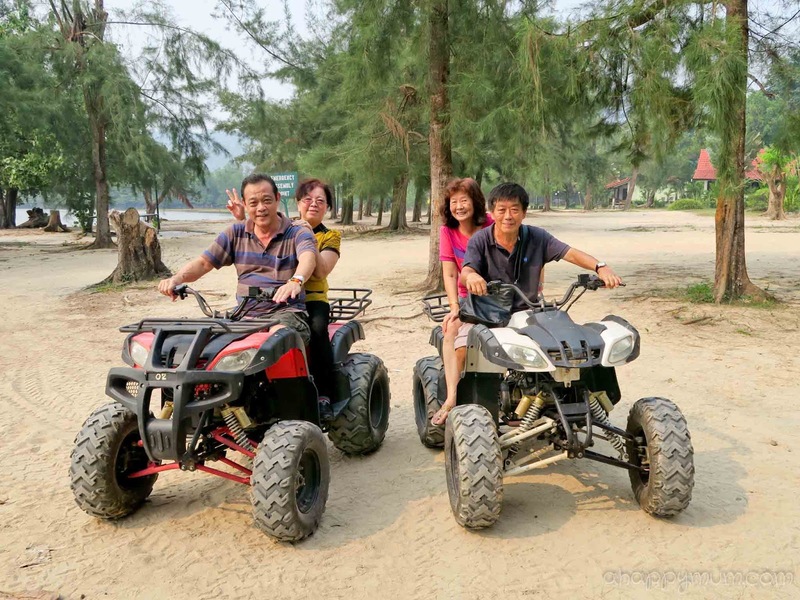 It's a beautiful resort to have fun and relax with the whole family, especially when we love the beach sports. 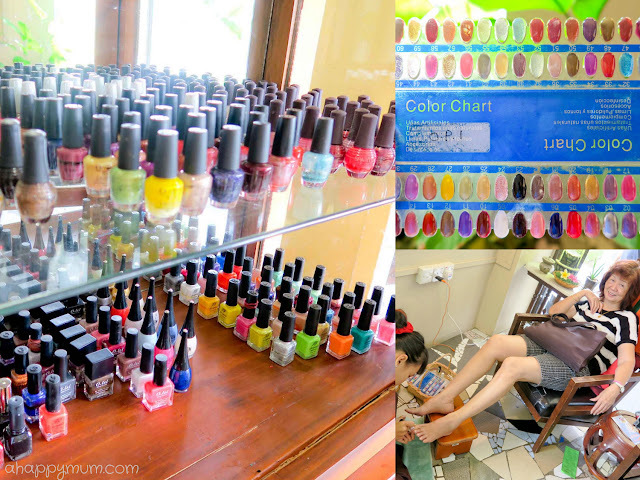 I'm also loving the Spa, pedicure and manicure. It's definitely a great place to go on a short trip with my loved ones. Love the family room that's next to the swimming pool! Think we could laze around all day...which is very relaxing and fitting for a family vacation! I love the family-oriented atmosphere and the pool looks so inviting! My last trip to Harris was about 6-7 years ago with a girlfriend. 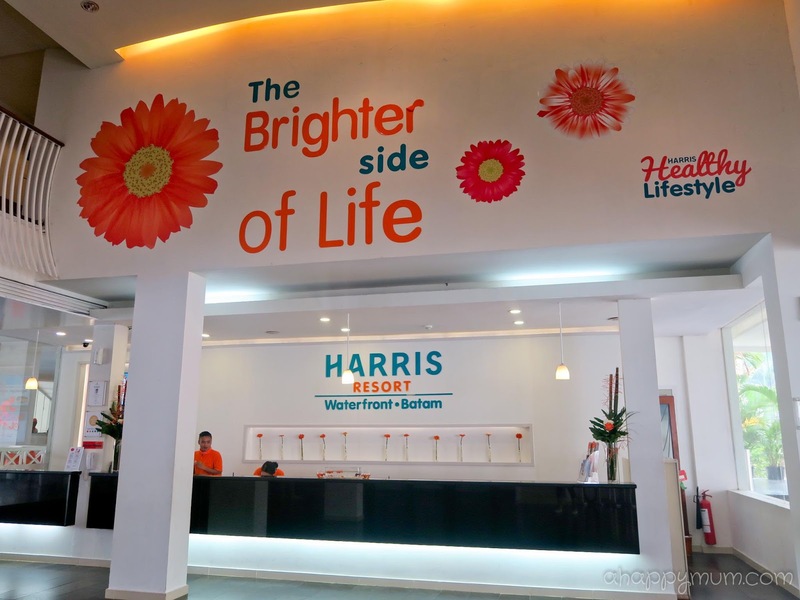 The good about Harris was their spa, pool and the bright colors they have in the resort. 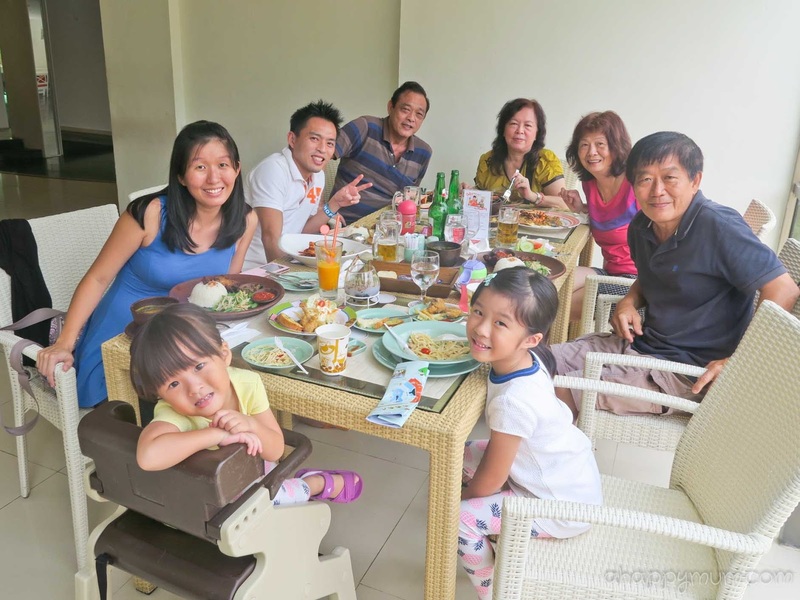 Give me a chance to go with my family and I will be able to how much they had improved with their resort facilities. I haven't been to Batam before and always wanted to go there for a short holiday especially when I'm really stress with work. 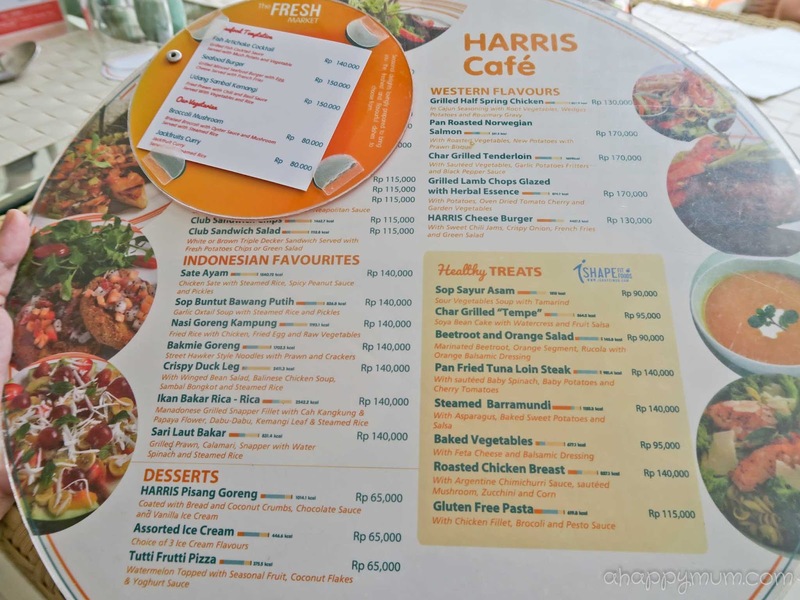 I find that the HARRIS Resort Waterfront Batam is a very good place to relax and recharge myself becos I'm a beach person who loves everything over there especially the comfortable room, beach activities and the delicious food. The family room !! So family friendly !! And the facilities are all nearby!!! I like spa & massage a lot and H' Spa and Wellness Centre that provides 31 kinds of treatment is the most suitable for me. The environment look cozy and relaxing. For the sports and outdoors activities, riding ATV looks interesting and fun too. I love the family room! A great place for both adults and kids! Facilities are all nearby too! Love the family resort! My son would love it very much! The facilities look new and good and interesting for kids to engage in! Hope to win and bring my son for a stayacation there! Everything about the Harris Waterfront Resort looks wonderful - especially the Kids room and the Dino Club. I am sure my two girls will have a fantastic time exploring the place. We can't wait to go there for a great staycation! I would love to go there with my family. A great place o stay. This looks amazing! Thanks for the opportunity. Super adore the family room! Proximity to the pool and complete with King sized bed for the adults and loft beds for the children, this is one super cozy room! 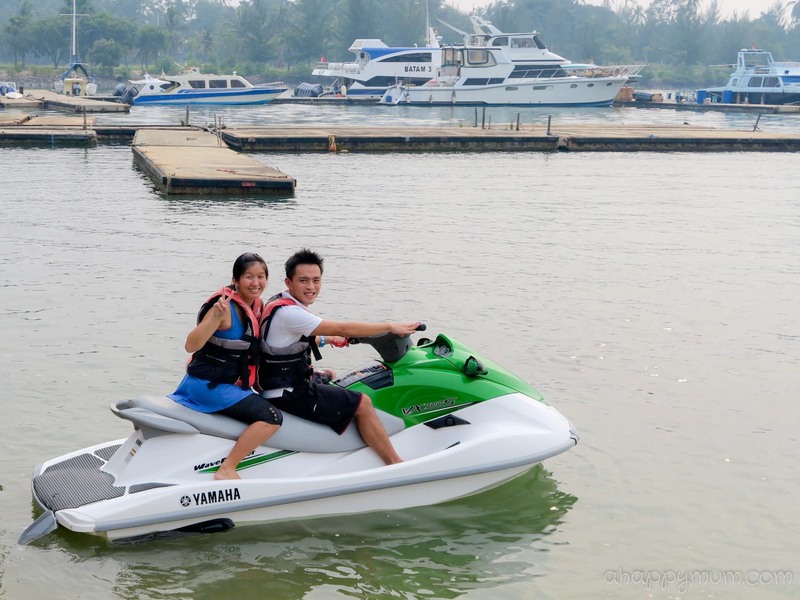 HARRIS Resort Waterfront Batam also has such a great variety of activities for both the young and old! Love most of the family room big and clean, this most important part for a comfortable room during travel. I love that it is a kids friendly resort with many activities for both the kids and the adults. Hi Your promotional code 'ahappymum' doesn't work. Hi, let me check with HARRIS on that. Thanks much. Thanks. As your blog was very informative and made me wanna plan a trip there in jan 2016 with my family. Thanks Kean. HARRIS replied to confirm that the code is working. Can you go to http://waterfront-batam.harrishotels.com/ to book and enter the promotional code 'ahappymum'? It will entitle you to 10% discount off best flexible rate without breakfast. Thanks. Thanks for telling me. I am asking them if the discount can be applied for family room too. The kids menu does not have a wide variety and includes general western fare like pasta, pizza and fries. Hopefully your 2yo can accustom to it or you can order non spicy Indo dishes like the crispy duck which comes with rice too. My most favourite will be the spa, its a long time since I pamper myself with a spa. 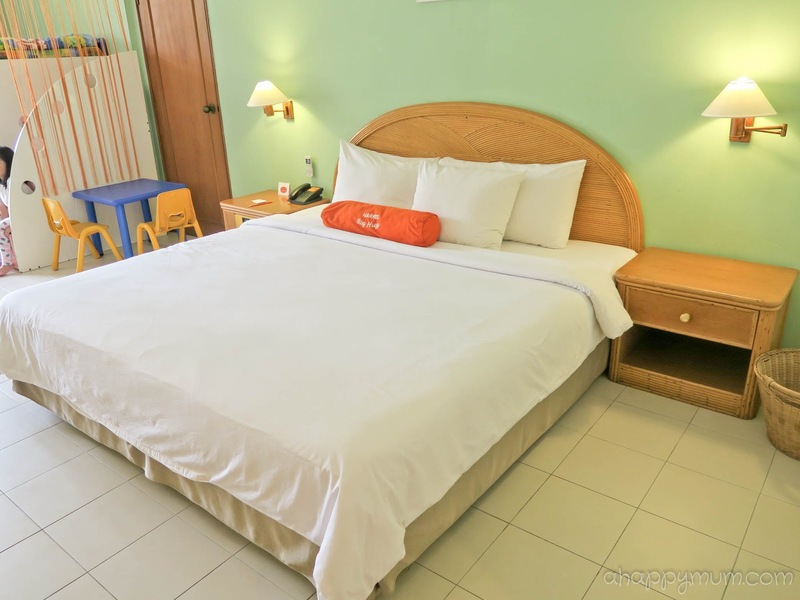 HARRIS Resort Waterfront Batam is definitely a great choice for a short getaway! 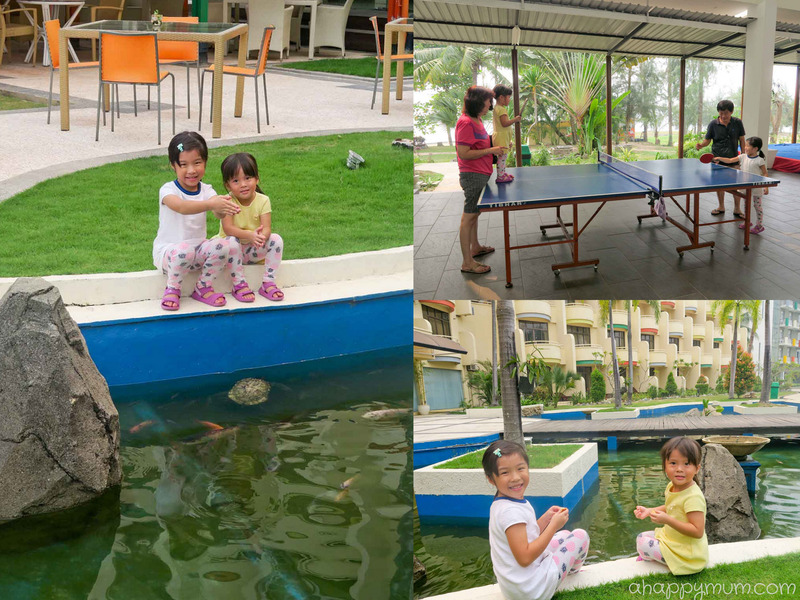 Simply love the numerous activities for both the young and old at the resort. Its a great place for the whole family to chill and relax without burning a hole in our pocket! Hope to win this as a lovely surprise for my wife who had been working hard the whole year caring for our family. The relaxing spa will be an awesome treat for her to chill out! Everything about the Harris Waterfront Resort looks awesome and amazingly fun for the young and the old. The spa for the adults and Dino club will be great fun for the kids. I am sure everyone will have a great time at the resort! Looking forward to visit the resort! May I know how many days you went for Harris? Your blog helped me a lot to plan Batam trip.